The sacrament of Christ's body and blood, and the principal act of Christian worship. The term is from the Greek, "thanksgiving." Jesus instituted the Eucharist "on the night when he was betrayed." 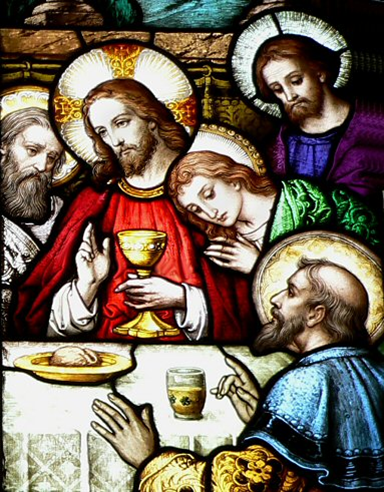 At the Last Supper he shared the bread and cup of wine at a sacred meal with his disciples. He identified the bread with his body and the wine with his blood of the new covenant. Jesus commanded his disciples to "do this" in remembrance of him (see 1 Cor 11:23-26; Mk 14:22-25; Mt 26:26-29; Lk 22:14-20). Christ's sacrifice is made present by the Eucharist, and in it we are united to his one self-offering (BCP, p. 859). The Last Supper provides the basis for the fourfold Eucharistic action of taking, blessing, breaking, and sharing. Christ's body and blood are really present (Real Presence) in the sacrament of the Eucharist and received by faith. Christ's presence is also known in the gathered Eucharistic community. The Eucharist is also called the Lord's Supper, Holy Communion, the Divine Liturgy, the Mass, and the Great Offertory (BCP, p. 859). The Hymnal 1982 includes a section with a variety of hymns for the Holy Eucharist (300-347), including "Come, risen Lord, and deign to be our guest" (305-306), "My God, thy table now is spread" (321), "Now, my tongue, the mystery telling" (329-331), and "I am the bread of life" (335).